Privacy and Conditions for Use Statement for Visit Saint Paul Official Convention & Visitors Bureau. Visit Saint Paul Official Convention & Visitors Bureau maintains this site for visitors’ personal information and education. Sites operated by Visit Saint Paul include: www.visitsaintpaul.com, www.visitstpaul.com, www.mysaintpaul.com, www.my.visitsaintpaul.com and www.idosaintpaul.com. Visitors may browse all public areas of this site. Visitors may not, however, distribute, modify, transmit, reuse, or use the content of the site for public or commercial purposes, including the text, images, maps, etc., without the written permission of Visit Saint Paul. Visit Saint Paul strives to include accurate and up-to-date content and information on their sites, but makes no warranties or representations as to their accuracy. Visit Saint Paul assumes no liability or Visit Saint Paul websites contain links to other sites. Visit Saint Paul is not responsible for the privacy practices or content of any site outside their own site content. Visit Saint Paul does not require any personal information for access. Visitors may choose to provide personal information via comment, question or solicitation. Visit Saint Paul uses the information visitors provide to improve service. Visit Saint Paul may forward visitors’ contact information to Visit Saint Paul partners or to other visitor service agencies. Visit Saint Paul may gather and store certain information about visitors. Visit Saint Paul uses the information to count the number and type of visitors on the website and to help make offerings more useful. Visit Saint Paul uses cookie technology and IP addresses to obtain non-personal information from online visitors and provide registered visitors with the best possible personalized online experience. Cookie technology helps Visit Saint Paul deliver content tailored to a visitor's interests and allows Visit Saint Paul to make ordering products, entering and participating in sweepstakes, contests and other functions on our site easier for our visitors. In such instances, Visit Saint Paul may associate personal information with a cookie file. Visit Saint Paul automatically keeps track of the type of browser (e.g., Internet Explorer, Mozilla Firefox) and operating system (e.g., Windows, Macintosh) used by a visitor and the domain name of the visitor's internet service provider. Visit Saint Paul tracks the total number of visitors to the site in an aggregate form to allow updates and improvements the website; personally identifiable information is not extracted in this process. This data tells Visit Saint Paul if more visitors prefer certain features or areas to others, which helps keep this site fresh and interesting for visitors. Visit Saint Paul partners include corporations, businesses and organizations that have joined together to service the Saint Paul convention and tourism industry. Private areas of this site are password protected and intended for Visit Saint Paul partners only. Passwords are provided only to Visit Saint Paul partners in good standing and can be terminated, changed or reassigned at any time by Visit Saint Paul. 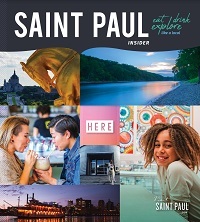 Website visitors may sign-up to receive email communications from Visit Saint Paul regarding upcoming Saint Paul events, attractions, hotels, partner business and meeting hosting details. Recipients of these newsletters are encouraged to designate the types of communications they would like to receive by clicking the “Update My Profile” link at the bottom of each e-communication. Users may unsubscribe from newsletters at any time by clicking the “One-click unsubscribe” link or by updating their preferences. Visit Saint Paul uses email addresses and contact information provided to inform users of opportunities related to the mission of the organization. Visit Saint Paul may, on occasion, purchase relevant contact lists to inform potentially interested parties of new opportunities available through the organization. These users will be given an opportunity to opt-in to future Visit Saint Paul communications. Should users refuse to opt-in, Visit Saint Paul will not add them to regular communications. Visit Saint Paul reserves the right to send communications on behalf of partners, but will not sell contact information directly to partners or any other organization. Any communications sent on behalf of partners will be subject to review by Visit Saint Paul to ensure its relevance and value to email subscribers. In order to keep visitor information secure, partners will not be given direct access to Visit Saint Pauls’ database of subscribers. Users have the right to opt out of partner communications at any time, while still receiving communications from Visit Saint Paul. Visit Saint Paul does not knowingly solicit personal information from children or send them requests for personal information but realizes that children may access site content. As a consequence, Visit Saint Paul may use information submitted by a child to respond to a question or request for information. Visit Saint Paul requires submission of birthday month and year when subscribing to email communications. Children under the age of 13 are restricted from receiving email communications. Visit Saint Paul does not knowing solicit information from children under the age of 13. However, information can often be provided anonymously and won't be associated with a visitor's name, address or email address. If Visit Saint Paul is aware that a young child has given personal information without parental consent, it will not be shared or sold to third parties, including our affiliates. Personal information about young children is available only to those who work on the site or who provide technical and support services to the site. Upon proper identification, parents may review the personal information collected about their child, request deletion or refuse to allow further collection or use. By updating this posting, Visit Saint Paul reserves the right to revise these terms and conditions.